Our 2017 review of the London retail colocation market analyses the impact of the wave of corporate activity that has hit the London market over the past couple of years. Sets the scene behind the wave of consolidation in the London and European colocation market by analysing the market conditions of 2013–15 and looks at what drove these transactions. Assesses the impact of the mammoth takeover of Telecity by Equinix, as well as other deals such as the Equinix disposals to Digital Realty Trust, the two sales by Infinity, data centre disposals by Centurylink, and the sale of 49% of Global Switch. Continues our analysis of the key colocation ecosystems in London: which sites these are, why are they so important, what pricing can the operators achieve in them. Provides detailed breakdown of the colocation development pipeline in both Central London and the M25 market. Includes charts, trends and analysis of retail colocation pricing in London. 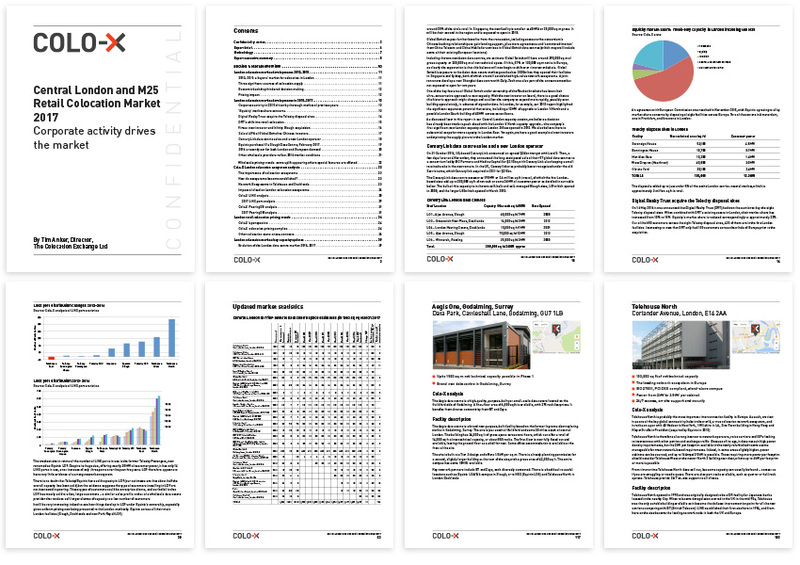 Features a two-page review for each one of the 60 data centres Colo-X is tracking in the London market. To learn more and view a full outline of the report’s contents together with lists of tables and illustrations, download our FREE summary. What has been the driver behind this wave of transactions – and what prompted the Telecity/Equinix takeover and subsequent market transactions? What has been the impact on colocation pricing for retail colocation users? Which facilities and operators have shown the most price resilience over the past few years – and why? Which London sites have the strongest colocation ecosystems and what characteristics make a colocation ecosystem in the first place? What new colocation capacity is coming on line and where is it located? The full 180-page report is delivered in PDF format. Payment is made online via PayPal. You can pay using a PayPal account, or checkout as a guest and use your credit or debit card. Alternatively, please contact us to arrange purchase by invoice. We also offer printed copies of the report and the opportuntity to meet or speak with the report author. If this is of interest, please indicate your requirements when you order. Further to you purchasing your download, we will contact you to discuss these requirements and outline the costs involved. This licence allows the report to be used within a company operating in one country. This licence allows the report to be used within a multinational organisation. This licence allows the report to be used only by one named individual. * Please note that VAT will be added if you are purchasing a report in the UK.